"....Professor of Economics “at large” as well as a member of the Higgins Labor Studies Program and Faculty Fellow of the Joan B. Kroc Institute for International Peace Studies. I was the editor of the journal Rethinking Marxism from 1997 to 2009." More details about David Ruccio is available here: About. David Howell is right: attempts to raise the federal minimum wage in the United States (from the current $7.25 to, say, $12 or $15 an hour) have been stymied by a no-job-losses rule—the idea (promoted by mainstream economists and employers alike) that the minimum wage should be set so that there are no job losses for anyone anywhere in the country. Determining a suitable federal minimum wage based solely on a zero job loss rule is a public policy straightjacket that would effectively rule out any significant raise of the wage floor above that which already exists. Yet from a historical perspective, strict adherence to such policymaking criteria would have also made it impossible to ban child labor (job losses! ), as well as many critical environmental and occupational health and safety regulations. It would also foreclose any consideration of policies like paid family leave, which exists in every other affluent country. As Howell correctly explains, the possibility of some job losses—for some workers, in some places—as a result of significantly raising the minimum wage can be countered by a combination of “emergency relief” (like extended unemployment benefits) and creating new jobs (e.g., through expansionary fiscal policy and public works programs). So, what stands in the way? Howell focuses on methodological problems (“because the identification of the wage at which there is expected to be zero job loss must be evidence-based, there is no way to establish the higher nationwide wage floors necessary for empirical tests”) and misplaced priorities (such as forgetting about “the moral, social, economic, and political benefits of a much higher standard of living from work for tens of millions of workers”). Both are valid points. But I’d point to a third: profits. The fact is, if employers threaten to let workers go (or not hire additional workers) if the minimum wage is increased, they’re attempting to protect their bottom line. If they kept their existing workers, so the argument goes, their profits would fall; and if they wanted to maintain their current level of profits, they’d have to fire some of their workers and replace them with one or another form of automation. It’s all about pumping out profits from their employees. Profits also enter the story in a second way. Private employers see the possibility of compensating for minimum-wage-induced job losses by offering workers public relief and by creating new jobs through public programs as a challenge to their existing control over workers, jobs, and ultimately profits. That’s the second reason they oppose an increase in minimum wage, because they know full well society has the means to make up for their willingness to eliminate jobs. But then their own role and the profits that come from that are called into question. For both those reasons—the threat to fire workers and the threat to their monopoly as employers—profits are the real obstacle to raising the minimum wage. David publishes a "Chart of the Day" post on this blog. 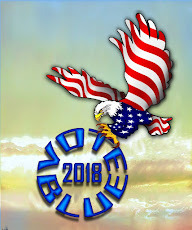 I highly encourage a visit to Davids blog, if you are a person who relishes basic talk words about the economy and issues related to the US economy. Ruccio on income and income disparity. Here’s another of my charts—this one for the top 1 percent—from the latest data on inequality in the United States created and disseminated by Emmanuel Saez and Thomas Piketty. 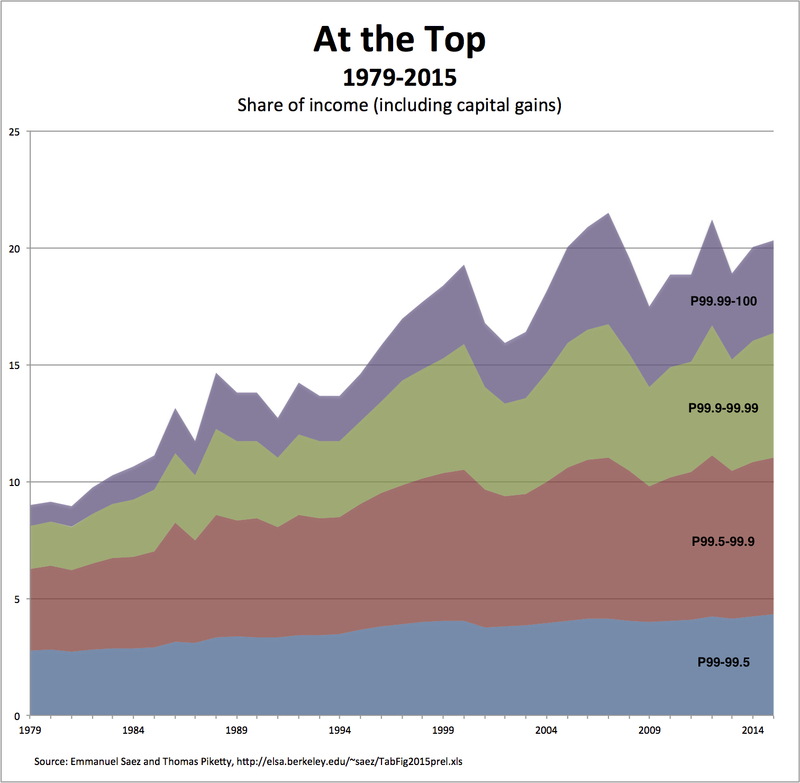 So, for example, the share of income captured by the top .01%, which was already high (at 0.9 percent) in 1979, increased by a factor of almost four and a half (to 3.96 percent) by 2015. The shares of income captured by the other subgroups also increased over that period, although less dramatically. I’ve included the actual data below. The previous chart, for the entire distribution of income in the United States, is here. As always, readers should feel free to use this chart and reproduce it as they wish.